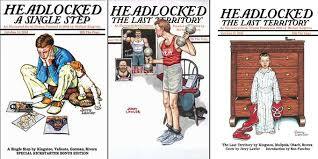 Right now Filsinger Games fans can jump right into reading the best wrestling comic on the market today, Headlocked! We recently released an 8-pack of cards featuring characters from the series’s most recent graphic novel, The Last Territory, in conjunction with Headlocked’s 4th Kickstarter campaign. Now in addition to picking up the card game itself, game fans can pick up the comic book series too! Right now Filsinger Games is offering 2 packages with both priced 25% or more off the cover price. One package includes the game cards, and both packages feature all 3 current graphic novels: A Single Step, The Last Territory Volume 1 and Volume 2. Each book has at least 120 pages of riveting reading. To check out all of our offerings from Headlocked Comics visit the online store HERE. ← 10 Things to Get Excited For at GalactiCon 2018!